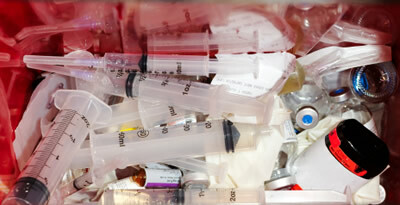 Medical waste consists of sharps, medicines, and controlled substances and it is considered a “special waste”. Handling medical waste carefully is very important in order to prevent someone else from getting pricked or sick. Not to mention, it is very important to keep medicines and controlled substances from contaminating our drinking water supply. The BuRRT Household Hazardous Waste (HHW) Collection Center DOES NOT accept medical waste. See below to learn how you can properly dispose of your household generated medical waste. Hospitals, home stays, and doctor’s offices should have a removal service in place and do not have the same exceptions as household medical waste. Disposing medicine down the drain or toilet can cause chemicals and toxins to pollute our environment, especially our ground water supply which can contaminate our parks, drinking water, farms and more. How should I handle and dispose of my medical waste? Sharps can go in the trash, BUT they must be in a puncture proof container with a cap and be properly labeled. Try using a detergent bottle with a screw-on cap and label the bottle with “shaprs” or “needles”. Once the bottle is full and the cap secured, place it in your household trash can. DO NOT put the bottle in the recycling bin or cart. Please don’t jeopardize other people’s health because of your carelessness. Pills, vitamins, prescription drugs, and any liquids (cough syrup, eye drops) should not be put or poured down the drain or toilet. It is very difficult for the waste water treatment plant to remove many of the chemicals that are in pharmaceutical drugs. The contaminated water can make its way into our rivers, fish, ground water supply, and eventually our oceans. Medicine should be crushed, wetted, bagged, and disposed of in the trash so it cannot be used. Heavily regulated prescription or non prescription drugs should be treated like medicine and never put down the drain or in the trash. Controlled substances should be crushed, wetted, bagged, and disposed of in the trash so it cannot be used. Or, talk to your local pharmacy or doctor to see if they will take back old prescriptions.